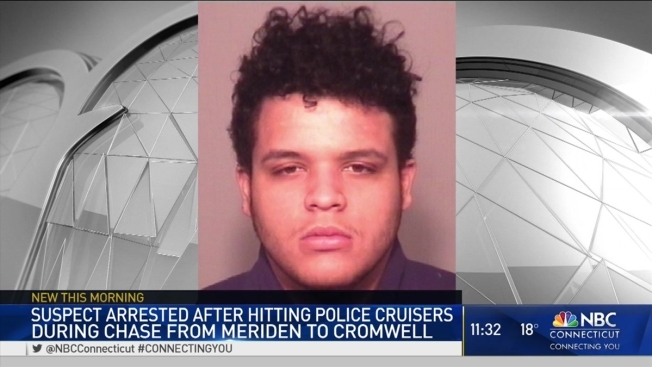 A 19-year-old Meriden man is in police custody after a police chase from Meriden to Cromwell overnight. Meriden police officers responded to City Park at 11:30 p.m. Monday to identify someone suspected of suspicious activity near a business that has been burglarized several times and the person fled and hit two police cruisers, police said. Raymond Ward, 19, of Meriden, led police on a chase from Meriden, through Berlin and into Cromwell, where he lost control and flipped the car on its roof, police said. Ward was charged with disobeying an officer's signal, failure to maintain lane, unsafe backing, suspended driver’s license, operating a motor vehicle without registration or insurance, misuse of registration plates, disobeying a stop sign, disobeying a traffic light, two counts of failure to drive right, two counts of evading responsibility, reckless driving, two counts of engaging in pursuit, reckless endangerment, interfering with an officer and two counts of assault on a public safety officer. He is being held on a $100,000 surety bond.